Tortoise N' Coconut is a fun game! 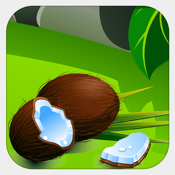 All you have to do is to drop the coconut by touching it. If you can drop it on the tortoise and kill it, you score. Every time you hit it right, the tortoise gains better speed. You have three lives. Each time you miss the target, you lose one life. You will be awarded titles based on your score.